Thank you to everyone who submitted an entry or voted. It’s been a great response for the first Photo Flash Challenge and we’ll definitely run another very soon. The quality of the entries was very high, including the ones that didn’t make the selected five. Two stories tied in receiving the most votes, and will therefore both receive one free entry into a Quarterly Themed Flash Competition. They are Cath Barton’s Even The Angels and Jan Brown’s Waves to the Moon. Both were very popular, getting lots of positive comments. Well done! Names and bios of the finalists have been added below. Once again, thank you to everyone that contributed, either by entering or voting! She had always felt safe with the moon. She knew it sounded like an utterly stupid statement, and she had to her knowledge never uttered it aloud. But seeing it glitter and glimmer through the branches as she led her bike past the huge trees that lined the sides of the road, she felt less alone. As if an old friend accompanied her. Although her question was met with silence, she imagined a faint whisper, a story of a place she had never been. It told of stories from foreign shores and mysteries yet to be solved. She sat down under a tree, closed her eyes, and listened. ‘I will go where you have been’ she said once she opened her eyes again, only to see that her companion had paled, and that the gold of the sun had started to appear at the horizon. The moon would rise somewhere else. Somewhere, someone would soon look up to the darkened sky and see him there. For a short while the world felt smaller, and she felt less alone. 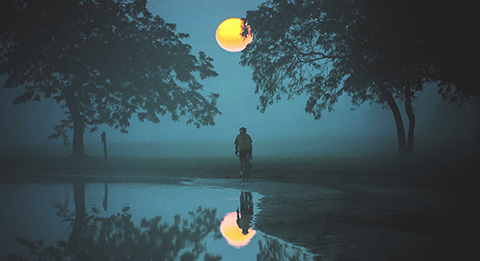 Getting back on her bike, she looked up to the sky, thanked the moon and made her way home. Author Bio: Camilla Johansson is a Swedish journalist preferring to write fiction in English. Already as a child she dreamed of becoming an author. This was, said the authorities, an extremely serious situation. Guidelines were drawn up, advice to stay indoors during the hottest periods and not to expose our skin to direct sunlight at any time of day. It was, they said, now too strong even in what were once deemed to be temperate climes. Of course there were those amongst us who thought they knew better, who said it was exaggerated, this so-called risk. Who said it was all about power and control, who said they were tired of the nanny state, who said they would do as they pleased. The consequences were so bad that newspapers would not print the pictures, but you could find them on-line. They made me shiver, those images, shiver even as the sweat ran down my back. They made me determined that I would not fall victim. I rode out only at dawn and dusk, keeping well away from the stench of the funeral pyres. The smoke veiled the sun, but it was always there, a pulsing golden disc. The relentless heat sucked moisture from the Earth. Once-huge lakes became mere puddles. Birds roosted silently in the trees. There was no flight. There was no song. Even the angels fell to earth; that was the worst of it. Their feathers were so soft and perfectly white. People picked them up, in ones and twos at first, believing that they would keep them safe. It was a crazy belief, but there was nothing now other than craziness. Angel feathers gathered in drifts like blown snow, piling up over the roofs of houses. There was nothing to do but to surrender, to lie upon those feather beds and go to sleep, as the ball of fire stopped the breath of every last one of us. Author Bio: Cath Barton is an English writer who lives in Wales. Her novella The Plankton Collector will be published in September 2018 by New Welsh Review. Cath is on the 2018 Literature Wales Mentoring programme, working on a collection of short stories inspired by the work of Hieronymus Bosch. I think I will always love the musky, humid haziness of a sunset in the summer. This is the time, as light grudgingly surrenders to darkness, when I feel the most alive and the most human. The daystar has lost its potency and a preternatural calm settles over the park. Sounds of life are muffled by the murk. Even if it lifted these sounds would fail to move me. I am apart from them. I am more, and at the same time, less. The shadowy half-light cloaks me and obscures me. I walk noiselessly, unnoticed and unregarded, watching the cattle lost in their own thoughts. They move almost lethargically in the oppressive heat that spills and rolls, steaming off the ground. Simple plodding creatures, driven by simple wants and needs. I almost envy them their ignorance. It cannot be though, we are each what we are and I am not them. A glint of light, like a demonic red firefly catches my attention. A straining, sweating man, clearly out of shape, cycles slowly around the water’s edge. He is seemingly pursued by the insect like glow. His pudgy face is contorted in effort. It is a bitter, sneering face. Perhaps his wife, or mistress, wants him out exercising to shed those many extra pounds of glutinous fat. Whatever his reason, he is not here for his own pleasure. He breathes hard. Lungs labouring in the moisture laden air. I can feel the heat from him. Blood coursing through his body, trying desperately to radiate the energy from his skin. The sun is now below the horizon and darkness is here. My moment of equilibrium is gone, it is time to feed and so I go to relieve the sweating man of his hot blood. Author Bio: Deke Kerr is a ‘complete novice writer’ who has spent the better part of three decades as an aircraft engineer working in the UK and abroad. There are generally ten books on his nightstand in various stages of consumption. He can become obsessive about the completion of immersive titles to the exclusion of all normal life. This is his first submitted piece of any kind as he doesn’t think an essay for his English language Scottish Higher exam counts. Each month she wanted something different: dark chocolate, red wine, jalapeño peppers, one whim after another. As her moods grew blacker, the demands became relentless. Cravings, she called them. He was despatched on his bicycle. Other men might not have been as accommodating. It was a three mile round trip to the 24-hour convenience store. Night after night, he emerged from the darkness, into the fluorescent lit aisles to make his purchases. At the counter, he handed over his cash, still breathless and wheezing a little, sensing his face was the colour of watermelon flesh. Ignoring how shopkeeper’s expression hovered between distain and sympathy. It was almost all uphill on the outbound journey. His bike waited for him against the lamppost. Thankfully he could cruise downhill on the return. The grocery bag swung from the handlebars, jars of pickles clunking against the wine. The night air cooled his skin, mosquitos tapping his face as he rode. Sometimes, if she’d been particularly hostile, like today, he took this detour past the lake on the way back in a tiny rebellion. Slowing right down to watch the mist rising from the moonlit water. Listening for owls. Her cycle always coincided with the full moon. And day or night he’d take to his cycle to keep the peace. Fetching like a dog. Something he could get right, at last. She would be in her dressing gown, crouched at the bottom of the stairs waiting in the darkness when he returned. He couldn’t buy what she craved most, but when he handed over the goodies, for a moment or two she appeared grateful. He would watch her carrying them to the kitchen, cradling them in the crook of her arm like a baby. Author Bio: Alexis Wolfe lives in Berkshire, she writes flash fiction, short stories and is working on a novel. I hardly knew my dad. I was young when he left me so what I have is a tangle of treasured memories, family whispers and wistful imagination. I invented stories in the playground to justify his absence: he was an astronaut working in a secret space station beyond the moon. That was my favourite. It’s hard when you’re seven and want to be normal like everyone else. I remember sitting on the crossbar of his bike, scuffed trainers propped on the handlebars, arms outstretched, pretending to be an aeroplane while he pedalled furiously through the park. ‘Faster,’ I’d yell and he’d laugh, press a kiss into my hair and pedal on, his breath ragged with exertion. I heard that laughter and felt that kiss each night as I struggled with the bogeyman who wouldn’t allow me to sleep. I remember the garden at night-time, clutched close to his chest as we strained our necks, watching for shooting stars. He would point out the man in the moon and talk softly, sadly about the world beyond. I remember his warm, comforting smell, his tight hug as he assured me everything would be fine, his promise that, when I needed him, all I had to do was wave to the moon and he would be at my side, even if I didn’t spot him. I say I remember. I don’t know. He left me. Now I stand on the beach, just as I heard he did. I can wave to the moon or I can walk into its safe embrace, there, flickering on the water. Just a few steps and I can find my dad again. I can find peace. Was it like that for him when, pockets weighted, he walked out into the ocean? Author Bio: Jan Brown enjoys writing, rediscovering imagination and discovering flash fiction. D) Mercy Dash gets my vote – excellent writing. E) Waves to the Moon – very moving. E) Waves to the Moon – gets the heart. Really enjoyed reading these. Hard to choose between them, but B) Even The Angels stood out for me. Beautiful story, I love how the character talks to the moon. Difficult choice all good stories. E) Waves to the moon – I loved the description of the relationship between the child and father, also very moving at the end. Even the Angels gets my vote. Beautifully written, and a topical subject as humanity destroys our climate and planet. Good title, and strong imagery. Congratulations to all the shortlisters. D) Mercy Dash. But a difficult choice, they are all good, well-written stories. B). Even the angels gets my vote because it’s a ‘sideways’ subject – a bit of magical realism is always unexpected. It was a battle between this and E). Waves to the moon which is also excellent and considered. D) Mercy Dash. Like this as it’s a bit different than the rest, with an impact at the end. Not quite what I was expecting! Even the Angels – poetic, topical and moving. E) Waving to the Moon. Very moving, sad and beautifully written. B) Even the Angels – for its originality, surrealism and imagery. I vote for Moonlit Night as I love the atmosphere that’s been created although all the stories are of a very high quality. They are all well written. I vote for E. Waves to the Moon. All good stories, but Waves to the Moon sticks in my mind the most. Gosh. Tough choice. Even the Angels just edges it. Wow – great selection! Have to go with D) Mercy Dash. B) Even the Angels is my favourite – though all are excellent! My favourite was D) ‘Mercy Dash’. But loved the idea behind B) ‘Even the Angels’. I’m going for Even The Angels in a closely-contested field. I’m amazed at the high standards of imaginative writing around today. These stories all hone in on a variety of human experience, but Even The Angels seems to me to have an extra dimension that pulls the reader up short. No skin off the others, though; it was hard to choose. Even the Angels gets my vote. Very tough choice between that and Waves. Bravo to both authors. Waves to the Moon – beautifully written and very moving. They are all fantastic stories but waves to the moon gets my vote. I really enjoyed C, D and E but I think in this case D – Mercy Dash gets my vote. Mercy Dash gets my vote. For me, it was very close between that and Even the angels. A great collection of stories. Thanks to everyone that voted. Results announced later today.